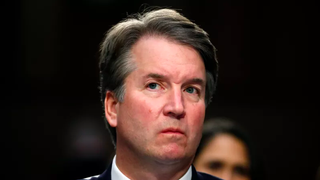 Senate Democrats are investigating yet another sexual misconduct allegation against Supreme Court nominee Brett Kavanaugh, according to a new report from Ronan Farrow and Jane Mayer in the New Yorker, this one from his freshman year at Yale. The magazine reports that a woman named Deborah Ramirez allegedly endured an encounter with Kavanaugh at a party in a Yale dorm during the 1983-1984 school year, when both were enrolled as freshman. According to Ramirez, the party included a drinking game that both she and Kavanaugh participated in. Ramirez was hesitant to come forward with the story because of her own inebriation, though the account was independently corroborated by others who were there. Other classmates of Ramirez, however, insisted that had Kavanaugh actually exposed himself to her, they would have known about it. “This is a woman I was best friends with. We shared intimate details of our lives. And I was never told this story by her, or by anyone else. It never came up. I didn’t see it; I never heard of it happening,” one said. What a great question. For now, Ramirez and her attorney, Stanley Garnet, are calibrating their next steps. “I do believe an F.B.I. investigation of this kind of character-related information would be appropriate, and would be an effective way to relay the information to the committee,”Garnet said. Looks like Republicans’ hopes to hastily push Kavanaugh through the confirmation process might not pan out.